Sorry, did you really think I was going to make it through an entire month in Argentina without one ‘Dont Cry for me’ quote. Well today it happened before we took the city bus tour. As we queued for the buenosairesbus.com tour the suntan cream was running into my eyes and one of my friends said ‘Dont Cry’ to which the reply was ‘for me Argentina’. Sad I know but there you go. So I finally made it down into the centre of Buenos Aires. The city bus tour looked like a good option if I was going to try and avoid being mugged, robbed, beaten up, raped, shot, stabbed and dumped in a skip. As Ive mentioned previously I had a whole shot list of photo ideas that I wanted to do but talking to my friends here in the current climate it would probably at best end up with me coming home several kilos of camera equipment lighter and at worst several kilos of body parts lighter. Going round on the tour bus Im not saying that my friends were being overly cautious but based more on travelling between tourist areas than the tourist areas themselves. So the plan was to be completely sad and stay on the bus for the first circuit and see if the weather improved. This involved no more effort than sticking the elbow out of the side of the bus and lying back. Of course sticking the elbow out of the side of the bus was precisely how I got a perfect triangle of peeling tan on my left elbow. by now of course this is now redder and deeper but thats another story. The first thing I noticed about our newly arrived open top bus was that it wasnt open topped. There had been some rain the day before and people got wet and complained and tried to get their money back. The bus company had then put the bolt on rooves on. Great to stop you getting wet, rubbish if you want to sit at the top of the bus and look all around you. To those people who complained about getting wet in the rain on an open topped bus I can probably guess your nationality, but sure come to Belfast, our open top busses have a forcefield that deflects rain so you can see all around you in the worst weather. Just remember its pay in advance and absolutely no refunds and dont beleive everything you read on the internet. So of course I managed to pick the wrong side of the bus, the row with no working headphones and even if they were the speakers behind me blasting out the spanish tour information would have drowned them out anyway. No-one thought to think that the high volume setting might need to come down a bit now theres a roof on. But still very little to see in the dull grey light anyway and even less to photograph. After about 3 or 4 stops of the hop on hop off tour no-one had hopped on or hopped off. I thought we were going to be the only saddos doing this but it turned out that the scare stories had indeed pervaded all of the visiting society who deemed it safer just to sit on this bright yellow bus. For those reading and if you are ever in the same situation, the left hand side of the bus is best, probably about 2 or 3 rows from the loudspeakers at the back. Judging by the number of tree branches crashing off the roof a crash helmet wouldnt be a bad idea, but definitely sunglasses. Thats todays health and safety announcement over. I love watching people and I had a real treat on this trip, in front of me was a tourist couple, German, who sat over two rows of two seats, both at the window side one behind the other. For most of the trip they sat with their backpacks on the spare seats beside them. People would come up to the top deck to look for free seats and they both would ruffle about in their bag to take up as much space as possible. You rarely see such coordination outside of the synchronised swimming in the Olympics. The old man in front had a wee point and shoot camera with a big screen so it would be rude of me not to look at what he was shooting. All I can say is dirty old man. Every time we stopped he would use the high vantage point to zoom down on some really good looking tanned womans cleavage and take a photo. Im describing this in great detail for research purposes only. I dont know if his wife was aware, didnt know, didnt care whatever but firstly I thought what a sleaze, secondly I thought I really should have brought my point and shoot (to blend in and be safe you understand, not to look down womens cleavage). Anyway at one point in the tour outside Recoleta these two stunningly beautiful tall blonde women came up to the top of the bus and had a look round for seats (either German or Scandinavian or similar). The old guy couldnt lift his bag off the seat quick enough, Im sure he was verging on hernia territory he moved that quickly. But they took one look and moved down the bus. Following them up the stairs were two huge black guys and our hero couldnt get the bag down in time before one took up residence beside him. I must have seemed a right idiot laughing away to myself.Driving round on the bus we got to see pretty much all the tourist sites and spots, in complete contrast to my previous experience, BA is a beautiful city, full of wide avenues, mixtures of old colonial buildings, modern architecture, european with a hint of not. The commercial area is pretty much the same as any commercial area in any big city in the world and down here it was the first I’d seen of multinationals and billboard type advertising. Again little to separate the place from most other world cities. Its the quirky nature of some places, the old decaying buildings, the former rich family palaces who when they fell on hard times sold out to foreign governments so there is an area filled with some of the best looking embassies in the world. Its not really a walk around city as a lot of it is very spread out (as the 3 and a half hour bus tour with only 12 stops) would tell you, but there are areas that it looked like it would be very safe to walk around. Its a strange mix, one of the locals told me theres no real middle class, just rich and poor and this certainly seems to be borne out travelling round. The bus tour mainly goes through rich areas but down around La Boca it goes through areas the police had told me not to walk through. Of course these are the areas with the friendliest people, waving and smiling at the people on the bus. So at this point I have a confession to make, well not a confession of sorts but more an explanation of how we work. I love getting all the tourist literature from a place and going through all the photos and comparing whats in the brochures to whats actually there. For example, if I want to photograph a place in Ireland at dawn I would scout out the location, pick a good morning with relevant clouds, pick area, pick spot, get there well before dawn, get photos, come home, review etc etc. This might take 2 or 3 goes due to changing weather conditions, some moron has parked a white van in the wrong spot 😉 or any multitude of things. So the finished images could have taken weeks of research and maybe a couple of years to get the right sort of conditions. None of which you are going to see speeding past in a big yellow bus. You might but its highly doubtful. Its like the city tour, coming mid summer isnt going to be a good idea, going over midday isnt a good idea, certain buildings will look better in the morning, or evening or in the case of the Theatro Colon, in May when they take the scaffolding down! Im glad there isnt a trade descriptions act for tourism or Id be permanently in court. 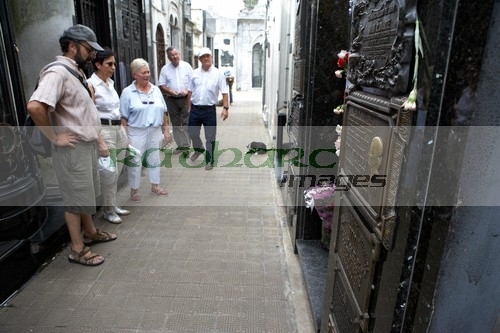 So bearing that in mind and taking a more realistic view of the descriptions of Recoleta cemetary I went forearmed. I have to say though, it lived up to every single description. 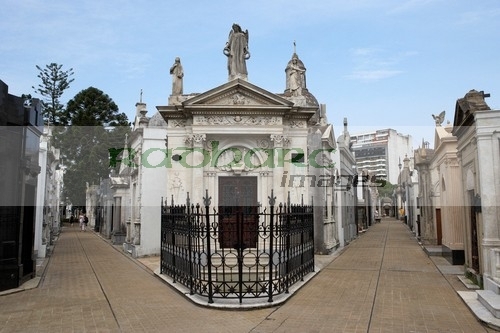 The cemetary is for the rich and famous of Argentina, its described as a city of the dead, with streets, walkways, ornate buildings. No-one is buried underground (at least that I could tell) and the whole place is a show of wealth and status, even when you are dead. Every word is true, Ive never seen the like of it before. Well organised and laid out, the equivalent of coffin multistoreys in some cases. Glass doors with small rooms with coffins neatly stacked and laid out. It seems strange for someone used to burying people in the ground or burning them to see them laid out in a small living room type environment. Some coffins hundreds of years old, in most cases perfectly preserved. In some tombs the marble has broken and bits of coffin sticking out here or there adds to the slightly eerie feeling when you find an avenue not populated by tourists. We spent time wandering around and avoided the headlong rush to Evitas tomb. One of my friends has a family burial plot there that they have never seen and we found it. A distant relative was a general in the army and judging by the size of the tomb was very well off indeed and very well thought of judging by the number of plaques. Wandering back I just kept an eye out for a queue of tourists and sure enough found evitas tomb. 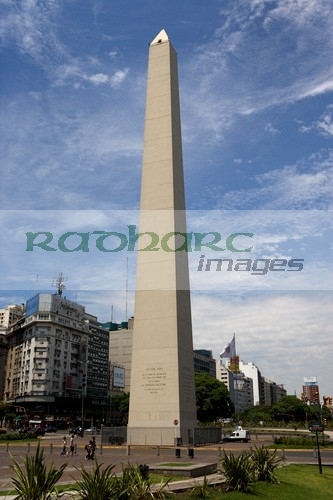 In relative terms it is quite modest compared to some there but probably the most famous for non-Argentinians. There is a busy market on the hill on the way up to the cemetary, something they dont show you in the tourist brochures of the walls 😉 Its a place selling all sorts of tourist tat but notorious for pickpockets so watch out. That pretty much sums up the bus tour of BA for me, lots of nice looking places but little in the way of real interest for me. I could have got on and off and did a lot more tourist shots of buildings rather than just drive bys but unlike other cities I do get bad vibes from acting the tourist here. Ideally Id like to take time over things hanging around waiting for decent or the ‘right’ light to photograph things, take pictures of local people doing local things and generally experiencing the life of the place but with a camera and lens worth more than most people make here in a year, the gulf in society, the massive and unpublished inflation and similarly underplayed unemployment figures I have to realise that I would like to go home in one piece. For me thats the saddest thing about being here, a beautiful city but I suspect there isnt much income from tourism to justify the extra spend making people feel safer. Travel forums are full of stories of tourists being victims of crime and yes the internet gives a voice to the dozen or so people affected, thats not to diminish their plights but there are perhaps thousands that nothing has happened to. Im not a normal tourist though, I carry a lot of expensive equipment, I have two cellphones with me, both of which have never left my room in the apartment. I have a ‘cheap’ swatch watch that has never been on my wrist since the airport, I cant wear half my travel clothes as they would signal me out as a target. Its something I feel stronger here, again perhaps my friends are being overcautious but as with the kidney stones incident it will be them left to pick up the pieces and I have to bow to their judgement, they are the people who live here and are on the ground day in day out. There are some beautiful photos of Buenos Aires out there, Id come with loads of ideas of how to do them my way but sadly thats not going to be the case, Im sure things will improve here, just as probably things at home might worsen. A friend of mine travelled round the world 10 years ago and has some beautiful photos of places you would never consider travelling to today. Similarly places he couldnt go then have become must sees now. Things will change, cruise ships regularly dock in Belfast now, something not considered just 10 years ago. 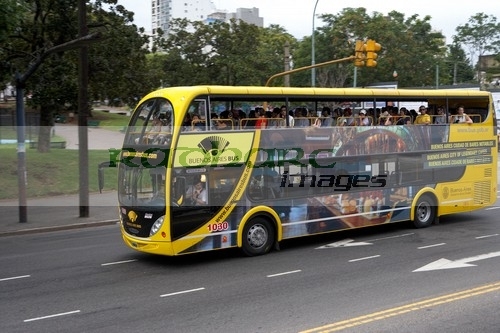 I have to say though, if you do get the bus tour and you only decide to hop on and hop off once, do it at Recoleta. It is probably one of the most unique places I’ve ever visited and I say that about very few places I’ve been. Speaking of which, its nearly time to pack to head to Iguazu Falls. Ive just checked the weather forecast for Wednesday and they have a ‘feels like’ value. In Belfast its normally something like 2C but feels like -5C. For Iguazu its 39C feels like 56C. Poke me with a stick and tell me when I’m done.